Although many already have given up on the idea that it’s possible to connect to customers for free on Facebook, others argue hope remains. Thus, to argue Facebook should be erased from your list of preferred social media channels is probably an overstatement. The question is 1) how to use the platform as it is set up today to benefit your brand and 2) how to fit it into your overall content strategy without wasting time unlocking the organic equation. In the following post, we’ll consider three possible Facebook hacks to maximize organic content delivery, based on the aforementioned warnings. 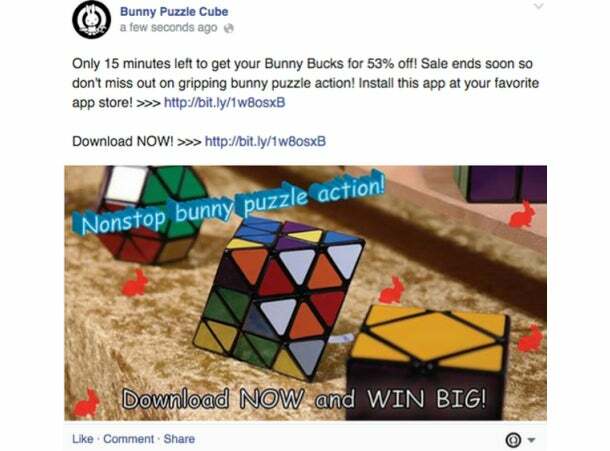 In its November 2014 announcement, Facebook identified two posts as an illustration of promotional content. 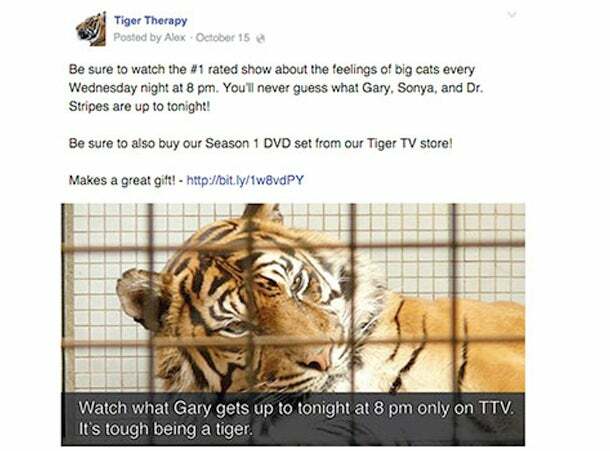 One of them, spotlighting a TV show about tigers, is listed above. It includes a prominent callout asking readers to buy the DVD. It includes a link to the store where the DVD can be purchased. It includes two additional callouts for the TV show, separate from the “buy this” charge. With that in mind, the first hack would be to simply steer clear of copy-photo combinations that include excessive calls to action. Several alternatives are available for the creative content marketer. First, take advantage of Facebook’s enormous visual real estate. Capture fans using your product in real life; spotlight your team members (or, in this case, those adorable felines); or simply share an inspiring quote. Treat your Facebook outreach as you would your behavior in a brick-and-mortar establishment. Educate rather than accosting. Second, tell people about your incredible product, but don’t force them into buying a dozen on the spot. Again, your goal is to inform. Draw on the talents of in-house artists to create a blueprint demonstrating how your product works. Shoot a 15-second video demonstration. But avoid accompanying text that encourages people to click a link to make a purchase. Third, embrace the tools already at your disposal. Remember, Facebook is only a component of your business outreach. Don’t forget about the fact people not only use your page for purchasing decisions but also to locate your URL, address, phone number and more. Be accessible without badgering. It asks people to act within a tight window of opportunity. It asks people to buy AND install (see Hack #1). It features the ambiguous phrase “Win Big!” ? ?That ambiguity is a general theme in recent Facebook updates. Pages posts should be relevant and meaningful to users, not sales-y and directionless; if you need to reach a specific audience beyond those general principles, Facebook provides a suite of advertising tools. Moreover, it’s still appropriately titled to optimize search traffic, where Facebook fans can visit for more details. It’s OK to include a mention or two occasionally on Facebook, but the real heart of your contest should lie closer to home. For those who hoped to morph creative into advertising without anyone noticing, Facebook has spoken: You’re out of luck. The above image from Facebook demonstrates the advertising presentation available to brands interested in paying for reach. Yet for Pages owners who simply want to make organic go farther, the message is clear. Spend time building relationships with fans and sharing status updates, photos and videos. When you’re ready to advertise, consult Facebook’s team of experts for the details. Originality is the bottom line here. People and computers alike can detect when you’ve simply lifted ad copy and slapped it on a status update. Don’t do that. Instead, take time to build community. Share what you’re doing at the office today. Ask fans to tell you about their weekend. Post an inspiring photo. Invite viewers to watch a fun or educational video. Direct fans to a compelling news story about a topic that matters to you. At this point,you’ve considered Facebook’s directive on organic content and what it might mean for your business. You’re realizing the reach you once enjoyed might not return—but there are still opportunities to engage in meaningful ways with prospective clients. Still, it never hurts to think about the future. A few excellent posts have been written, specifically this one in Business 2 Community about the need in 2015 to invest in “ignited” content—posts that cut through the noise of web publication. Also be sure to check out these five tips from AgoraPulse describing ways to make Facebook go farther (yes, for free), including posting at non-traditional times and embedding content. Bookmark Facebook’s newsroom for the latest announcement that will once more adjust how your business communicates online. Then read, experiment, and read some more.